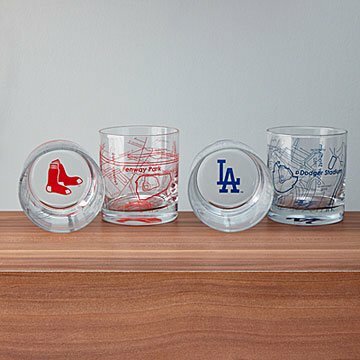 Each set of two whiskey glasses features a map of an iconic MLB stadium in the team's two main colors. Calling a baseball stadium just a building is like calling the Louvre just a museum. A true fan's ballpark is sacred ground, and these are a true fan's glasses. Each set of two whiskey glasses features an overhead map of an iconic MLB stadium in the team's two main colors. When you've taken your last sip, you'll see your team's logo in the bottom. They make a fantastic gift for the baseball lover who knows diamonds are forever. Made in Pennsylvania. My boss is a huge Mets fan - I knew this would make a perfect gift and he absolutely loved it! Awesome gift for any baseball fan! Use it for drinking purposes, but could also be used as just decorative around the house. It is such a cool product -- I'm definitely going to by the Citizens Bank Park set for myself! Delightful and unique gift for a super Braves fan! Paired with a nice Irish whiskey for a birthday gift. Love this product, what a unique gift!